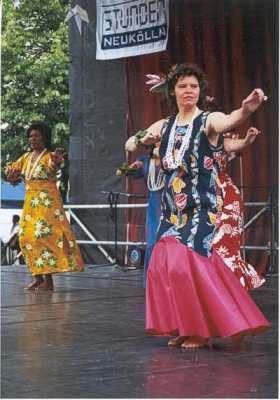 Our Hula Calendar was dominated by three memorable events in June 2004: our performance at the Henry Berger Anniversary Celebration in Coswig on June 26th and the weekend of June 12th and 13th with two events in Berlin, the “Long Night of Science and Humanities” and the “Worlds in Motion” international dance festival. To commemorate the passing of Henry Berger 75 Years ago, his hometown of Coswig, Germany (about 1.5 hours drive southwest of Berlin) had organized a two day event to which we were asked to perform as the only Halau Hula. Other performers included the youth dance group “Eamanu Tamariki” from Atiu (Cook Islands), Choirs, a classical orchestra and the local gun club’s brass band. 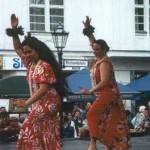 To our exceptional surprise and pleasure we learned upon arriving in Coswig that two world class Hawaiian musicians would accompany our dances: Mr. Aaron Mahi of the “Royal Hawaiian Band” and his friend, singer at the Opera in Honolulu, Mr. Dean. We already were happy to have two friends from Berlin play for us, professional musicians Lansinga and Michael. The spontaneous rehearsal we improvised in the still empty beer tent was greatly enjoyed by everyone taking part. We couldn’t help but marvel at the sensitivity and graciousness these professionals showed us amateurs by following our tempo and filling our requests for old standards without even blinking. Dancing on stage at the historical monastery were: Anna, Beth, Edna, Luana, Merle, Sabine, Silke, Sonja and Una. The order of Hulas were as follows: Oli Kahea, Oli Huakai, Ho’opuka, Ha’aheo o Hana, Kawika, He’eia, E Lili’u e, Anapau – followed by a non-dance segment by our “band” with the song “Kupa Landing” – Kaulana Na Pua, Ho’i. Dr. Schweitzer, chairman of the “Friends of the Royal Hawaiian Band”, who joined us on stage, simultaneously translated “Kaulana Na Pua” to the German speaking audience, which helped to bring this Hulas important meaning across. Our performance at the prestigeous final slot in the two days program was very successful with the few “insiders” who travelled so far to be there and with the locals alike, some of whom watched Hula for the first time. On June 12th 2004 Berlin’s three universities joined forces to present the “Long Night of Science and Humanities”. 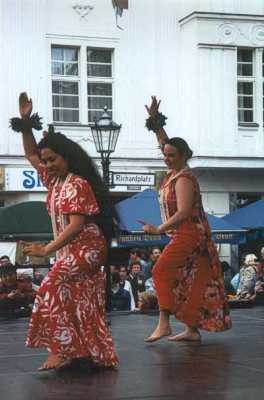 Luana organized a Hula workshop at the Ethnological Institute of the Free University in Berlin, Dahlem, where she is a student. The workshop was primarily directed at children. Luana was joined by Sabine and Una as presenters and Anna and Simin as dancers. She completed and corrected our remarks and answered any further questions of the participants. The workshop presented “Huki I ke Kalo”, explaining movements, melody and obvious meaning first, and finally the hidden, mythological meaning of this Hula. The workshop was run three times for 30 minutes each with an attendance of 8-10 children and adults. Several people chose th “just watch” as well. During the breaks we worked on leis for the next day. Edna sold out her home cooked filipino delicacies at the snack stand next to us. That following Sunday we performed at Richardplatz in Berlin-Neuköln at the “Worlds in Motion” multicultural dance festival. Because we – Anna, Edna, Ines, Luana, Merle, Sabine, Silke, Simin, Sonja and Una arrived early and other dancing groups were still missing, our performance was pushed ahead, which caused some hectic reactions. We also had some sound problems at the very start of our Kahiko program, which was: Oli Huakai, Ho’opuka, Ula No Weo, Ho’i. Nevertheless, we came across quite dramatic and powerful, thanks in part to our red and yellow costumes, which we wore with our new Raffia skirts for the first time. 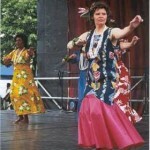 After changing into our Mu’u Mu’u, we danced “Pua Mana” and “Ke ‘Ala Ka’u I Honi”. Thrilled by our colorful dresses and fresh flower adornments, several photographers asked us to pose backstage. This performance is of special meaning to the author, since I was first lured by a TV broadcast of last years “Worlds in Motion” event to contact the Halau and become a member soon thereafter, a step which has truly “moved my world”.